It is easy to say, but making it happen requirestwo enormous strengths: the power to have flexible and innovative ideas andthe power of technological know-how to realize those ideas.As a total manufacturer of factory and office automation systems,Murata Machinery is constantly engaged increating new and innovative technologies. Our corporate goal is to achieve an affluent society andto satisfy our customers by providing the perfect product for every need.Offering products to meet today’s needs anddeveloping new products to exceed tomorrow’s expectationsMurata Machinery is committed to maintaining its creative efforts. 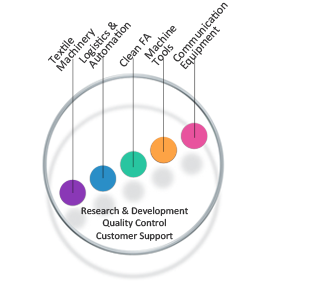 High-performance machine tools transforms efficiency and quality in production. In 1961, we entered the field of machine tools which supports modern industry at the core. Since then, we have constructed systems that integrate machining processes for volume production by combining gantry loaders and a wide variety of peripheral equipment on the basis of high-rigidity and high-precision machines. Along with this, we have established a record of achievement and experience around the world, especially in the automotive parts industry, through the provision of production systems best-suited to customer needs. It is our desire to continue to promote further improvements in machine performance, and also assist customers by providing new production systems and machining applications while considering productivity improvements from a customer point of view. The roots of the sheet metal machinery department can be traced back to 1970, when we joined up with the Wiedemann Division of The Warner &Swasey Company; which was established in Philadelphia, USA in 1916, and released the world’s first CNC turret punch press. After that, we have pursued product development and released new products one after another, including plasma ark combined machines and laser combined machines, and also construction of large-scale flexible manufacturing systems. (Wiedemann still exists today as Murata Machinery USA.) Sheet-metal-processed products realize value by going through many subsequent processes of not only punching, bending and other machining, but also welding and assembly. Efficient creation of this value requires a manufacturing perspective with all processes taken into consideration. We develop processing machines and systems based on such a perspective, and also offer recommendations for total optimization of machining processes, including reviews of processes and methods, while sharing customer concerns. Through the pursuit of total optimization, we will continue to contribute to customers’ value creation.